- Current models: Pro, Axcess, LP Custom, etc. ... and THEN there are aging preferences for seemingly all of the above lines including "VOS" aging (which is different than the VOS models, I think), "lightly aged", "heavily aged", etc. This is my opinion and some on here may think I am stupid or do not know what I am talking about but here it goes. If I was gassing for a custom gibson of some sort, I would rather spend the money on a true vintage 1970's era les paul rather than a custom shop reissue of 59 or anything like that. Back before the gibson custom shop hit the market, the gibson custom guitars were regular production guitars made at the same factory as all of the others. I had a 1981 les paul custom that was made at the Kalamazoo plant. It was a very fine guitar and there were no issues. I have played 1970 era and early 1980 era gibson guitars and they just seemed to be good quality all the way around. I have played only a couple of the newer generation gibson custom shop guitars. One was a 59 VOS. I was not impressed at the cost of it compared to how it played and sounded. If you spend your money on a gibson from the 1970s, you can actually purchase a vintage guitar even though it may not be a 1959 or 1960 guitar it is still a 40 plus year old guitar. The wood has aged and if the owner has taken care of the guitar and the truss rod works still, it would be a better investment in my opinion plus you can find them cheaper than the new custom shop models too. Plus why spend money on fake aging techniques compared to a true aged correct guitar? If you just have to have a gibson custom shop guitar then I understand and go for it if you have the chance and the desire. Some or most of you will probably disagree or think I am stupid or can't afford a gibson custom is the only reason I say this but, this is only my opinion. The Custom Shop does make a variety of LPs for sure. The two main categories would be historic and non-historic (my terminology). Then you get into the specific models. As for which one floats your boat the most, that's all subjective. 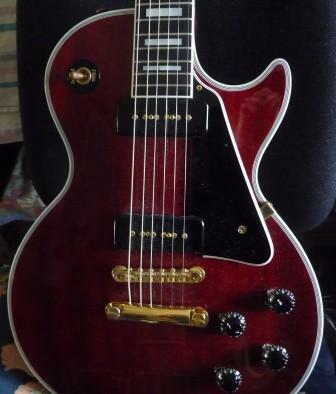 For me personally, the most desirable would be a 59 or 60 burst, but that's just me. As for the CCs, artist guitars and such, it may be silly for me to say this considering how much I've spent on these things, but I wouldn't spend any more money for a specific replica guitar. But, if you're really a fan of someone, maybe that's worth it to you. As for the aging, that's all personal preference too, and budget. When I first started looking at historic LPs I thought I wanted a VOS. Over time that changed and when it came right down to it, I got them in gloss and I don't regret it. As far as the Murphy aging, that's a whole other thing. You either like it or you don't, I guess. I couldn't see buying a new guitar that someone scratched up intentionally, no matter how careful they were in doing so. That's just me. But, apparently a lot of people like them and that's great, I won't knock 'em. The one thing I will say is that with a Murphy aged guitar you don't have to worry about it getting it's first scratch. But, when Murphy scratches it, the value goes up. When I do it, it goes down. As for Standard vs True Historic, if I'm not mistaken, all of the historic's are considered True Historic these days. Standard Historic ($5K approx): "Standard Historic Reissue Guitars are the culmination of a quest of over twenty years to deliver the look, tone and feel of a vintage Gibson guitar based on our own intense passion for the originals and a dedication to the finest levels of materials and craftsmanship. Includes hardshell case." True Historic ($8K approx): "The True Historic Les Paul Reissue Aged Electric Guitar from Gibson Custom features reformulated plastics based on lab analysis of original vintage parts, double-carved and hand sanded neck and top profiles, Murphy Aged, thin wet-sanded lacquer, Custom wound Custom Bucker pickups, Hot Hide Glue joinery, historically accurate serial number. Available in very limited quantities, this is the closest you can come to owning an original vintage Les Paul from the 1950s without actually acquiring an original. Comes with True Historic COA with guitars exact serial number, die-cast True Historic badge over the Rhythm/Treble switch access cavity and hardshell reissue Les Paul case. The True Historic range represents fanatic new levels of detail accuracy, employing new processes, new materials, and new skills to give you an entirely authentic ownership experience, placing the beauty, feel, and tone of an original 1950s Gibson in your hands. You simply can't get closer to the real thing...than the real thing. - Rolled Fingerboard Binding: It's all about feel and playability"
I think all that changed in '17-'18. I can't find thew video right now but I think they're all spec'd as True Historic's now. For decades, Gibson Custom's handmade Historic models have given players and collectors the tone, feel and soul of rare and coveted vintage Gibson guitars. 2015 saw the most comprehensive benchmark in the quest for historical accuracy with the introduction of "True Historic" construction and parts. Gibson Custom is pleased to announce that in 2018, the Historic Collection will utilize those features and more in every year-specific guitar recreation. From hot hide glue construction to chemically re-engineered parts to precise contours based on scans of hundreds of vintage examples, Gibson Custom proudly believes we are at our pinnacle in terms of attention to detail and magic added by the fine American craftsmanship and expertise found within the Custom Shop walls.